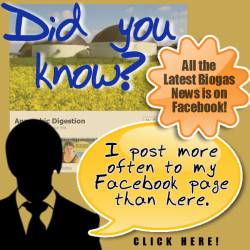 Biogas Plant Grit removal was seldom built-into first generation AD Plants. Ever since the first of the current generation of anaerobic digestion plants were commissioned over 15 years ago, a recurrent problem has been the gradual accumulation of inert materials in digester tanks. If it gets into digesters it reduces the reactive volume and gradually builds-up over time, reducing biogas plant efficiency. For some biogas plant operators, the only solution has been to pump out their tanks, and start again. Doing that means a lot of wasted time and revenue. It takes time to remove large quantities of silt, sand, and grit, and re-commission AD plants. This represents a lot of lost biogas production, apart from the cost of the work, and disruption caused to activities on the farm. That’s why we were delighted to be able to publish such good news from Fre-Energy! Read on to find out how you might cure a similar Biogas Plant Grit removal problem in a biogas plant. Describing your highly innovative technology as ‘a slurry tank with a lid on’ is unlikely to win any marketing awards, but with nine successful farm-based AD plants in the UK and a new worldwide patent, Fre-energy’s simple grit-removal system could make their Biogas Plant Grit Removal technology the must-have agricultural installation. 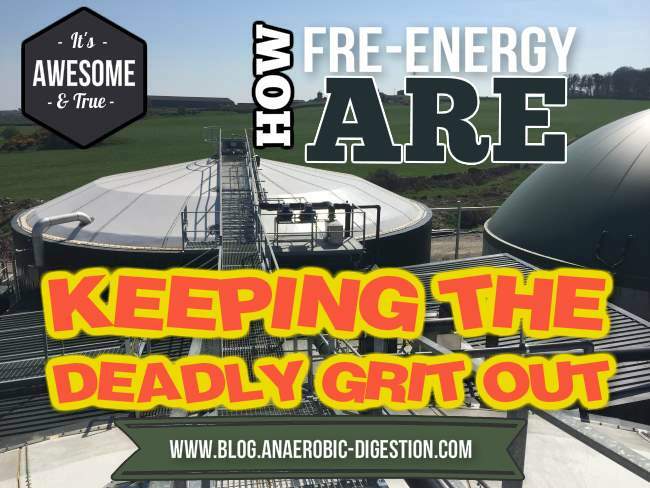 Since the development of new Biogas Plant Grit Removal technology by Fre-Energy, grit, sand, ash, soil, glass, metal and other inorganic contaminants from the tank do not enter the process at Fre-Energy’s biogas plants. This has proved especially advantageous when using chicken litter as a feedstock, which typically has very high levels of grit. The capability to extract grit and silt also extends to root crops, food waste, slurry from cattle bedded on ash, sand and other high grit inputs. In short, there is never a need to stop the digester to empty it. No downtime. No loss of the heat or power for use on the farm and export to the grid. And, importantly, no health and safety risks associated with the opening of the tank. In this article we also describe the role of Landia’s equipment at Fre-Energy’s anaerobic digestion plants. Big numbers tend to dominate renewables headlines, with seemingly the more Megawatts being generated the better? – but you won’t find Fre-energy’s name in those news-grabbing figures. Instead, for Welsh organic dairy farmer Richard Tomlinson, his goal when seeking to introduce AD to generate all of his heating and electricity was to complement his farms’ organic milk production – not to create a rural power station. He sought true sustainability. Under the umbrella of Fre-energy (Farm Renewable Environmental Energy), Richard’s closing of the loop comes in the shape of nine extremely efficient AD plants that support the core business of farming. In addition to the company’s de-gritting technology is the highly reliable Landia pasteurization and pumping equipment it has invested in. Combined with dynamic organic waste management and a very efficient slurry management system, the results make a very convincing case for any dairy farmer with over 300 cows to introduce an AD plant as the key to sustaining their business – particularly in rural settings. In the international market, with so many small farms working together with a centralised AD plant, the Fre-energy model with its very low energy usage, is hard to beat. “In the UK, FiTs (Feed-in-Tariffs) subsidy scheme is not our driver. We see the electricity, heat and fertiliser we produce as natural fit by-products that whilst not making headline figures, are now an integral part of our sustainable business”. At Lodge Farm in Wrexham, Wales, the first of the nine Fre Energy sites, a new separate lagoon was constructed within the larger storage lagoon in order to store the slurry and pump it underground to the digester half a mile away on a fortnightly basis. This not only ensured that slurry would be delivered to the digester as fresh as possible, but provided a clean and convenient solution, rather than transporting the slurry across the land or by road. In the reception pits at Lodge Farm, two Landia long shaft chopper pumps (7.5kW) with integral mixing nozzles chop and blend the tank’s contents; initially processing 25 tonnes of slurry per day from the organic dairy herd, as well as chicken litter (6 tonnes per day) before pumping the liquid into the 1000m3 digester. Each Landia pump is designed with a knife system that prevents breakdowns by being able to deal with higher dry matter content such as straw, commonly found in liquid manure. In 2015 Lodge Farm became a licenced food waste site. Now, in addition to the farm wastes, materials from local food manufacturers and a nearby hotel is first treated by a 5m3 Landia pasteurizer (hygienisation unit) tank that conforms with ABP (animal by-products) regulations. Designed with an integral heating jacket and an externally mounted side-entry propeller mixer and chopper pump to reduce particle sizes, the pasteuriser heats the liquid to the required 72 degrees for one-hour batch processes. There are no moving parts inside the pasteuriser, so there is no need to enter the tank to carry out maintenance. There is also a 7.5kW Landia submersible mixer (300rpm) in Fre Energy’s post-digestion store. “None of the Landia equipment requires intervention from us. It passes the test every time and very much fits in with what we do. Our AD process with our patented de-gritting system is also low on energy use. Our digester is mixed using less than 7kW of pump capacity – running at only 30% duty – so only 2kW of mixing energy is required for our 1000m3 digester”. “I also like the fact that Landia are a long way removed from pump salesmen who’d worry about getting their shoes covered in mud at a farm. Landia understand what we and farming are about – and when necessary won’t hesitate to roll up their sleeves to help us”. Based on the results in Wrexham, Landia’s pumps and mixers now feature strongly in Fre-energy’s nine-strong and expanding network of successful farm-based AD plants. Lodge Farm’s small-scale non-headline but totally consistent energy generation is 160kW of electricity and 200kW heat. Approximately 30kW of electricity is used on site to power the engineering business, the Fre-energy office and the farmhouse, whilst around 60kW of heat is used to heat the cow slurry and chicken litter in the digester up to 40°C. The rest is used to heat the house and office, with surplus electricity exported to the National Grid. Top quality digestate is also a fundamental part of the Lodge Farm ethos. The digestate goes through a separator and then stored in a lagoon (that has 6 month storage capacity) before being spread onto grassland. The solid digestate, which contains a higher proportion of the phosphate and potash, is transported by road to land used for growing winter crops to feed the dairy herd. Trials conducted by Bangor University have demonstrated that the BOD (biological oxygen demand) of the digestate is reduced by up to 90%, representing a substantial benefit to the environment. It also has around 80% less odour than typical cow slurry, thus making the spreading of manures far more socially acceptable. The commitment to the closed loop system begins right at the entry gates to Lodge Farm, which are powered by the AD outputs. Here in this part of North Wales there is conclusive proof that investing in AD will reduce your carbon footprint and drive agriculture forward. Kilowatts might not make the same eye-catching headlines as Megawatts, but the simple yet highly effective biogas plant grit removal solutions in Wrexham, are true next generation agriculture that sets a great example. For more information about the Grit Removal System referred to above, visit the www.fre-energy.co.uk website here. For more information about Landia long shaft chopper pumps, the Landia submersible mixer, and Landia’s pasteurizer (hygienisation) units, visit Landia’s website here. Useful life of biogas plant In calculating the depreciation, the economic life-span of plants can be taken as 15 years, provided maintenance and repair are carried out regularly. Himark BioGas International has announced the issuance to it by the South African Patents Office of a patent that covers a grit removal system for anaerobic digester tanks. Please do you have advice on where we can get rid of our digester clear out silt/ muck? We have nowhere we can spread it.